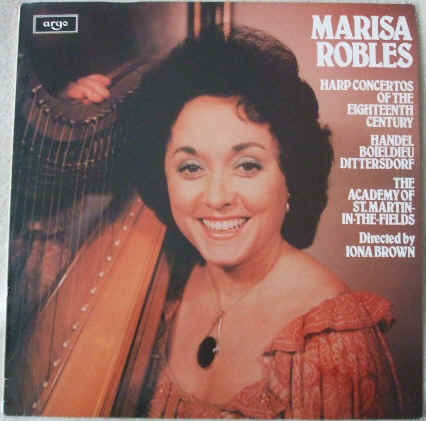 33rpm LP Record of ZRG 930 HARP CONCERTOS OF THE EIGHTEENTH CENTURY, (Handel, Boieldieu, Dittersdorf), featuring Marisa Robles on harp, accompanied by the Academy of St Martin-in-the-Fields directed by Iona Brown. It was issued on the stereo ARGO label in 1980. UK pressing. The outer sleeve is graded very good, with no more than light wear (light rubbing to edges, bumping to corners, creasing to bottom corner around the spine). The original inner sleeve has no wear to speak of.